This effort resulted in the increase of student and faculty participation in interdisciplinary sustainability curriculum (i.e. incorporating skills and habits from the geosciences into their teaching) and not just presenting connective ideas. In total, approximately two-thirds of all Wittenberg students have participated in engaged sustainability curriculum between 2014-2016. This transformation extends beyond the single instructor environment; multiple faculty collaborated with each other in co-teaching, guest lecturing, guest panel experiences. It also initiated multiple community internship opportunities (City of Springfield, Parks and Recreation District, Citizens Climate Lobby, Hagen Center for Civic and Urban Engagement) for students that expanded their sustainability learning beyond the classroom. These collaborations across single-instructor boundaries were informative to both instructors and students. Twenty Wittenberg faculty have participated in InTeGrate-related curriculum development (module implementation, community project development). As a result, approximately, one-quarter of faculty at Wittenberg now incorporate sustainability into at least one of their courses. We built connections with between Wittenberg faculty and with multiple faculty from three nearby schools who implemented modules and have collaborated with us on other courses activities, events, and grant planning. ~50 faculty and 30 pre-service teachers outside of this effort participated in other student-centered teaching workshops hosted by faculty leaders who incorporated pedagogical ideas from InTeGrate (Active STEM teaching, Noyce Scholar Active Learning Workshop, Engaged Teaching Workshop). Faculty who implemented curriculum all have interest in continuing to incorporate materials, practices, and topics. We estimate that two-thirds of all Wittenberg students now take courses that address sustainability. This will grow to all students as the First Year Seminar program continues and all students gain this exposure. We estimate that this is likely a doubling of student participation in sustainability curriculum. 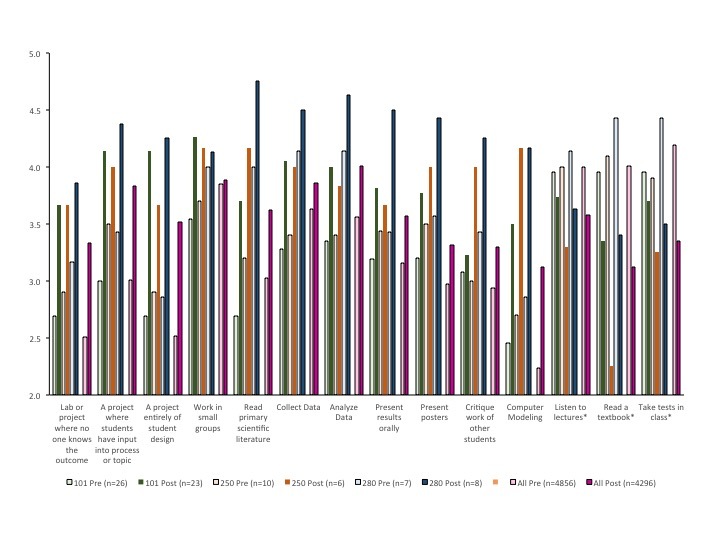 Three-fifths of all reporting students (n=335) in the First Year Seminar reported that the Sustainability Activity made them more aware of their personal impact on the environment in an end-of-semester survey. Our exit survey also provided some insight into the previous exposure of entering freshmen to sustainability topics. Interestingly, 81% of reporting students report that they have had previous class exposure (in college or high school) to topics of sustainability and global climate change. Greater than 1/3 of reporting students have had exposure across multiple courses. Only 40% felt the activity was valuable within the context of the larger program, 27% were neutral, and 31% did not think it was valuable. Barriers to perceived value could include the contrast with other content in the course. This contrasted with many of the other activities in FYS that were largely completed in class with no academic expectation (e.g. credit for completion). Several reported that it was stressful to have to meet during Earth Week, which fell just before finals. Potentially, this activity could be modified to better fit the style of other FYS content. 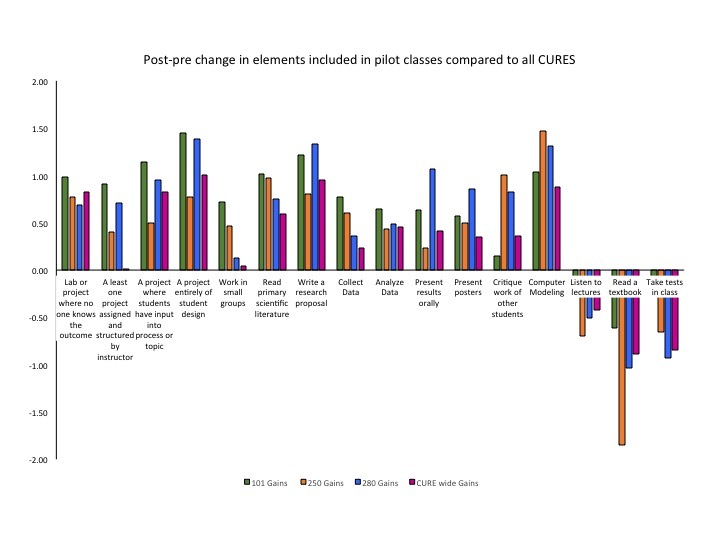 In preparation for our last project phase, which will develop interdisciplinary projects in collaboration with partners, we utilized several assessment tools in existing project-based courses, including project work using an InTeGrate-modified Inquiry and Analysis Rubric, the Course-based Undergraduate Research Survey (CURE), and the Community Service Attitudes Scale. Pilot courses included Introductory Environmental Science (ESCI 101), an upper-level Environmental Science Research Methods (ESCI 250) course, and Topics in Biogeochemistry (ESCI 280). All courses included collaboration with local partners who helped frame the nature of the project. In addition, similar to InTeGrate modules, projects involved analyzing authentic data to better understand grand challenges in sustainability. Students specifically reflect on the needs of collaborating partners. Student reported mastery of course elements. Answers correspond to: 1= no gain or very small gain, 2=small gain, 3= moderate gain, 4=large gain, 5=very large gain. Specifically, in Introductory Environmental Science (ESCI 101) students evaluated biotic and abiotic conditions associated with land use conditions in collaboration with a local park. Students presented a poster with proposed land improvement strategies to improve ecosystem services and diagrammed the impact of proposed improvements. Approximately 10 hours were dedicated to project data collection and analyses, but other research skills, including proposal writing, were incorporated into labs before the partner project began. In Environmental Science Research Methods (ESCI 250) students, gained expertise in planning and executing environmental monitoring. They read literature and collaboratively designed sampling schemes and created maps in GIS. Work in the early semester framed understanding needed to partner with local community gardens and others with an interest urban health issues. For example, students gained basic GIS skills through working with census and CDC data in the county to map factors related to soil lead risk (e.g. housing age, income, blood concentrations of lead in children). The final project had students design and implement soil testing, and then present soil lead maps to partners. In Topics in Biogeochemistry (ESCI 280) students diagramed the fluxes and fates of ions associated with agricultural and urban land use. They then researched the water quality concerns in their watershed and, in small teams, identified water quality parameters to explore locally to improve watershed management. Teams collected and analyzed ion data using an Ion Chromatograph and gained expertise in laboratory methods and quality control. They then presented preliminary results to a local watershed manager who provided feedback to improve their interpretation. Students better contextualized their results by comparing them to other data and key studies. They presented final results to the watershed manager. Student reported mastery of course elements. Student reported change in pre to post course learning. Wittenberg students reported overall higher mastery of learning elements examined than other courses and summer experiences featuring research. Pre to post course gains better help contextualize learning gains with potential student inflation of mastery. 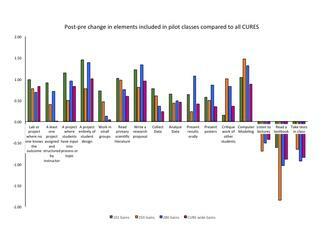 Note that elements not featured in courses with research appear as losses. Interestingly, major features of each class are areas of greatest gain. For example Environmental Science 101 incorporates proposal writing in an assignment and the final project; Environmental Science Research Methods (ESCI 250) involves multiple GIS assignments (computer modeling); and Topics in Biogeochemistry (ESCI 280) has the greatest emphasis on presentation to a community partner. We've developed strong ideas on supporting faculty change. Please see our advice and framework for building capacity for more details.